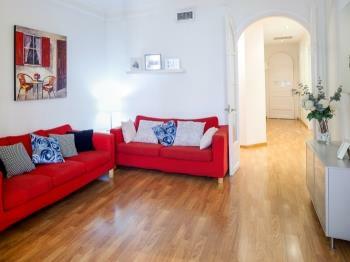 The Gran Via B apartment (HUTB-003615) is on the second floor of an Eixample building with an elevator. The apartment has one master bedroom with a double bed and an ensuite bathroom, one twin bedroom and a sofa bed in the living room. 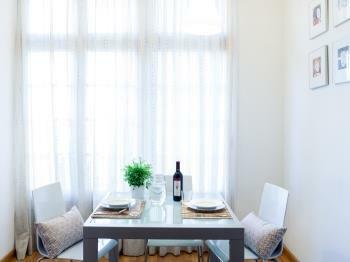 In this Barcelona apartment sleeps up to five people. 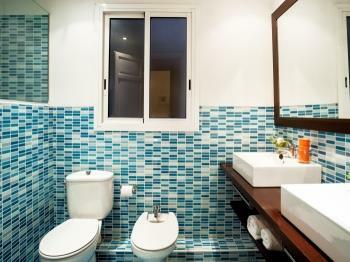 There is also a second full bathroom. 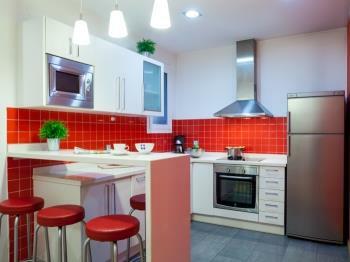 The kitchen is completely equipped and is close to a spacious and comfortable living room with a sofa-bed. 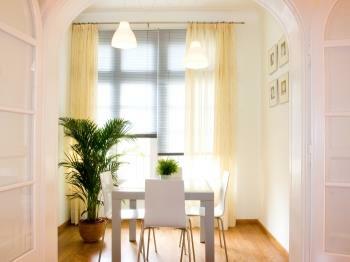 The dining room is placed in the old gallery of the house, a calm and light space with a table leading onto a balcony. 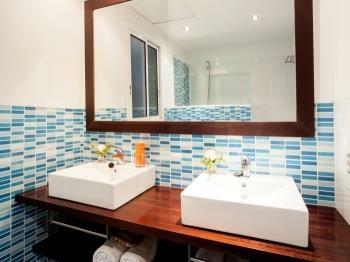 Two bedrooms apartment (HUTB-003615) recently renovated. The architectural structure preserves the original modernist style and the facilities are new. 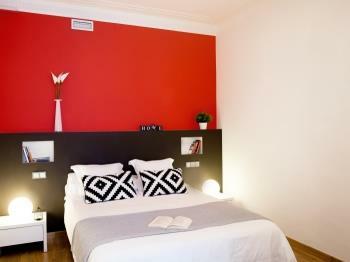 The layout of the apartment and the high walls will give you a sense of spaciousness. The bedroom with double bed has ensuite bathroom with shower. There is a second bathroom with shower in the apartment. 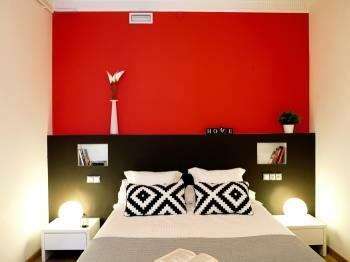 The second bedroom has two twin beds that can be set together. The kitchen is fully equipped to offer you the maximum versatility: you will have space to make dishes or you can heat already elaborated dishes. The dining room is a very pleasant space due to its luminosity and the balcony that has views to a courtyard of neighbors very typical of the buildings of the Eixample. The apartment is located in a building which has other resident neighbors. 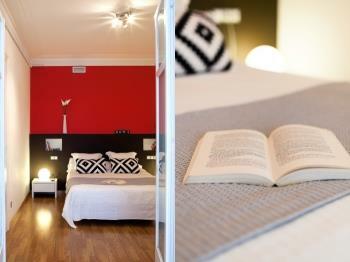 The apartment is exclusively for you during your stay. Before your arrival you can contact us by e-mail if you have doubts to prepare your trip. 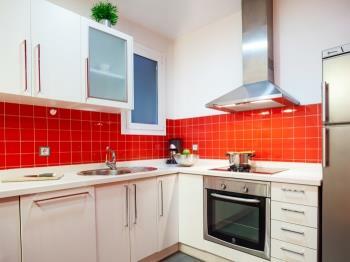 Upon the check-in moment we will explain you how to use the apartment equipment and where to find what you may need. You can ask us the questions you may have. During your stay, you can contact us via e-mail or by calling our telephone where we will take care of you 24 hours. During the last century, the area of l'Eixample was the booming neighborhood of Barcelona and the one chosen by the bourgeois families of that period. 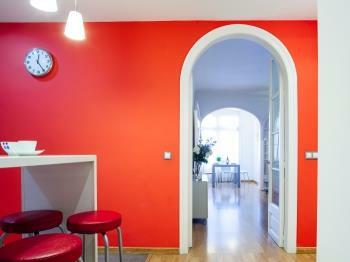 The constructions are spacious and have a rich architectural interest. When you leave the apartment, you can enjoy a walk to discover the modernist style where you will arrive to Passeig de Gràcia to visit "La Pedrera" or "La Casa Milà". If you are looking for calm in this active city that is Barcelona, you will like to visit Montjuïc taking walks through its parks during the day or to attend the magic fountain show at night. Near the accommodation you can visit "Las Arenas", an old bullring transformed into a shopping center, and next to you will have Miró park. Although most of the visits can be done on foot, in the area you will have the following public transports: Metro Rocafort (L1 - red), metro Plaça Espanya (L1 - red and L3 - green). In Gran Via and Paral·lel Avenue there are multiple bus lines that will take you to other points of the city, such as the beach. 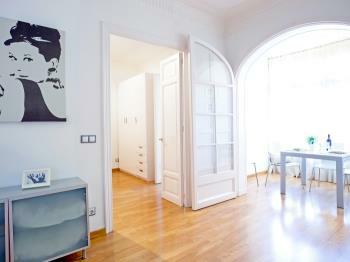 This beautiful apartment (HUTB-003615) is located on a second floor with lift of a typical construction of the Eixample. 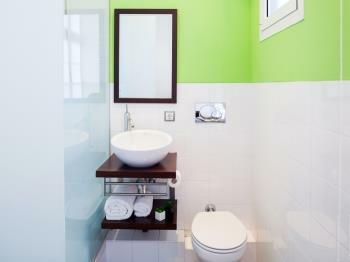 The apartment has been recently renovated, maintaining the spirit of the classic Barcelona buildings and adding elements of modernity and design to create a perfect combination and make your stay comfortable. The open space kitchen is fully equipped with an oven, a microwave, a dishwasher,pans, saucepans and other utensils for your comfort. There’s a bar with four high stools where you can easily take your breakfast or a quick meal. In the living room area there’s a table with chairs, a couch that can be used as bed, some furniture and a sat TV. There’s a balcony facing a courtyard where the sunlight enters during the afternoon. The master room has a double bed and a toilet with shower inside. 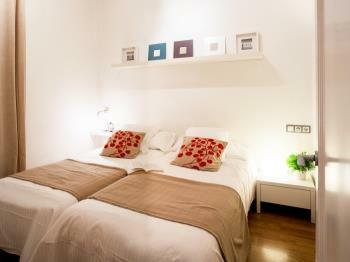 The second room has two single beds that can be set together. There is a second bathroom with shower at the apartment. There is free WiFi connection in the whole apartment.